Travel with Kevin and Ruth! : What the heck is that?! Actually, it's just a little bug. But our new camera has a "super macro" setting where you can take extreme closeups...check this out! I thought he was kind of nasty looking. Turns out he's REALLY nasty looking! So I looked up what this little guy is. He's called a "pseudoscorpion" and he's totally harmless. These things can live 3 or 4 years. Anybody want a pet? Speaking of wildlife, Ruth went for a walk with her dad yesterday and came across a few things. What are YOU lookin' at?? A Yellow Lady Slipper which is in the orchid family. Whoops, this isn't wildlife...it's K.C. the dog! An pair of osprey has a nest on the train trestle. They've been coming back here every spring as long as I can remember. And we finally got a pic of more life the other day. Some of you will remember our friends Alfredo and Mary from our visit to Puerto Escondido, Oaxaca, Mexico in January. She was pregnant at the time, and had a baby boy on April 11th. 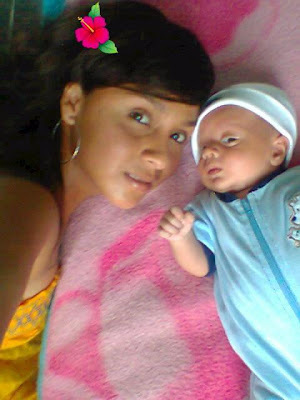 Alfredo Gael, with his aunt Olivia. We've been keeping busy here, helping out around the house. Ruth's Dad lives here alone in the big old house and he's getting on in life so there's always something that needs doing. I'm in the process of cleaning all the windows, and Ruth's been helping in the garden, and vacuuming and cleaning the floors. No way would I own a house this big! It's too much work! nice job with the new camera!..happy housework day!!! Beautiful photo of Alfredo Gael and his aunt. Who said men don't do windows? Oh Lordy. A boy with a new toy. Oh..I mean, *nice camera work*! I don't think I need to look at any bugs up that close, but thanks for the effort. Off to vote. As usual. Love the shot of Porky! Always housework to be done, large or small home! Really nice of you guys to help out Ruth's dad in his efforts to keep his big old house. Bet it works really well in reminding you why you're glad you don't own one. Boy those ospreys don't care where they nest do they. Having those trains rattle by and shake the thing up seems like it wouldn't be so nice for them. Luckily only one train goes by each week once up and once back. Been that way for years. Yep, it is a great reminder for not wanting a big house ever again, not that we had a big house to start with. In our mind less is better! Fun playing with the new camera isn't it. No big houses for us, we like what we have. Oh eeuw, what a horrible looking bug. Can't stand anything naturally born with 6 feet or more. Macro photography is so much fun and that bug is gross!! you can keep it. Great shots! Have voted again. Glad you are in the running for winning!